This year’s First Fortnight Festival is taking place from the 2nd to 12th of January. The ‘First Fortnight‘ 2013 line up includes Friz, Solus, Morgan DMC, Will Saint Leger and ADW. Since its inception in 2009, First Fortnight’s key aim has been to challenge mental health stigma and prejudice through the creative arts. A charity-based organisation, First Fortnight is run entirely by seven volunteers. ‘We believe the arts allow us to create a space where people can talk about mental health issues in a very non-scripted manner and help to change people’s perceptions about an issue that effects us all. Dylan Hansard brings us a quick peek into Dublin street artist, Solus and his after hours’ adventures with paint and paste in the video below. Check out his new site solusstreetart.com or facebook Solus here. 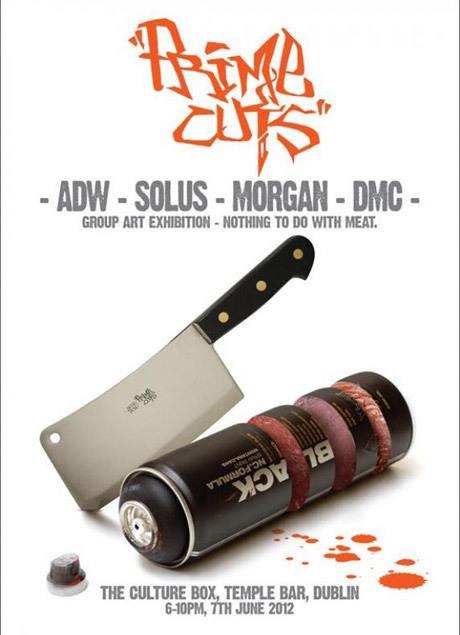 Four Acclaimed street/urban artists, ADW, Solus, Morgan and DMC have come together to bring you this long anticipated group show in NGG Temple Bar. ADW, one of Ireland‘s most recognised stencil artists, best known for humurous stencils. 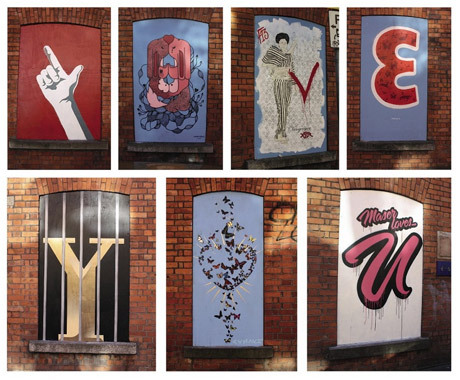 ADW has had 2 solo shows in Dublin in recent years you may be familiar with some of his iconic steet art. Solus, the last punk left in town, returns to the NGG after a successful solo show there last year. His work can be seen in the streets of Dublin and sometimes elsewhere. Morgan is one of Ireland‘s most innovative artists he has exhibited extensively throughout Ireland and further a field. He works with a range of different mediums but is more street than leafy suburbs. DMC is one of Belfast‘s best known street artists. His new work will blow you away. The sixth annual Kings of Concrete takes place in Dublin this weekend. This year’s giant graffiti line up includes ADW, AKA Crap, Andto, Askim, Brian Coldrick, Canvaz, Chris Judge, Colm MacAthlaoich, Darren John, David McClelland, Grim, Hawkie, James Kirwin, Jine, Kube, KVLR, Naser, MasterZ, Morgan, Mr. Steve, Myne, Omin, Phats, Risto, Rolk, Scie, Solus and Vetza. For more information visit Kings of Concrete 2011 on facebook. Dublin based street artist, Solus, has recieved notoriety, not only for his work in Ireland, but also in London, Bristol, Spain, New York and Amsterdam. Solus tells us his bio would go something like this: Enjoys painting, getting tattooed, old-time music, coffee, punk, South Korea, collecting art, hustling, loose lips sink ships, staring longingly into burning fires while weeping openly.